Leading Manufacturer of box stretch wrapping machine and pallet stretch wrapping machine from Pune. We are offering Stretch Wrapping Machine to our clients. 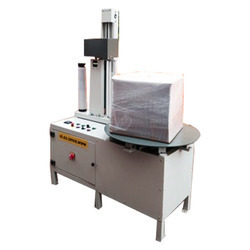 It is a semi-automatic machine able to wrap objects on pallet with stretch film. 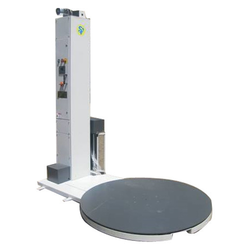 The machine turns around the product to be wrapped, driven by a contact wheel, and during the rotation, by a reel carrier placed on a telescopic mast, wrap the object for all its height. All this happens in most simplest way. Such is the technology that even a lay-man can operate this machine. We hereby assure you not only reduced man power, but also, independence from skilled labor, increased efficiency & better aesthetic to your packing. We are offering Pallet Wrapping Machine to our valuable customers. 4 programmable cycles: full cycle (up and down) - single cycle(Only upward) single cycle with top sheet wrapping - full cycle + top sheet wrapping. Looking for Wrapping Machine ?